This torsion spring is constructed of steel and it includes a stationary cone and a winding cone attached to opposite ends of the spring. These types of torsion springs provide lifting force for heavy garage doors and must be selected by the spring s dimensions, rather than the door s weight. See the product specifications with illustrations found in Prime-Line s Torsion Spring Selection Guide to assure that the proper replacement spring has been selected. In the case of dual spring installations, note that the proper use of LEFT WIND & RIGHT WIND springs is imperative. Also, when dual spring installations are involved, it is important to replace both springs, as replacing only 1 spring may add increased strain to the older non-replaced spring. This torsion spring is a regular duty spring with an estimated lifetime rating of 10,000 cycles. As an important safety precaution: all broken or malfunctioning hardware should be replaced with matching hardware, without any modifications. These garage door torsion springs can cause serious injury if not handled and installed properly. If attempting to replace the torsion springs yourself, it is important that the removal or adjustment of torsion springs is not attempted with any other tool other than Prime-Line s item number GD-52238. Failure to utilize Prime-Line s item number GD-52238 for the replacement of these springs may result in severe personal injury. These winding rods are used to wind and unwind the tension on torsion springs and they are the only tools recommended for this purpose. Note: To determine the handing of your torsion spring wind, look at the end of the spring with the finger of the spring at the top of the wind. When the end of the spring is at 12:00 o'clock and it is pointing to the left, the spring is a right wind; if the end of the spring points to right (positioned at 12:00 o'clock) it is a left wind. When standing inside the garage looking outside, the torsion spring with the black painted winding cone installs on the right side of the door, and the torsion spring with the red painted winding cone installs on the left side of the door. Right hand springs are mounted to left side of center and left hand springs are mounted to the right side of center (inside the garage looking out). 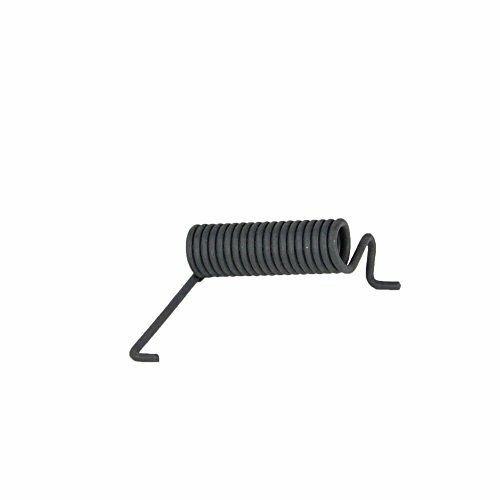 Use this steel left-hand wound torsion spring to replace broken garage door springs of matching dimensions. It includes mounted stationary and winding cones with .243 wire size x 1-3/4 inside dimension x 32 length with red color code. 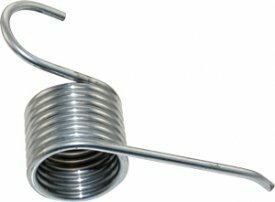 This torsion spring is a regular duty spring with an estimated lifetime rating of 10,000 cycles. These types of torsion springs provide lifting force for heavy garage doors and must be selected by the spring s dimensions, rather than the door s weight. See the product specifications with illustrations found in Prime-Line s Torsion Spring Selection Guide to ensure that the proper replacement spring has been selected. As an important safety precaution: all broken or malfunctioning hardware should be replaced with matching hardware, without any modifications. These garage door torsion springs can cause serious injury if not handled and installed properly. If attempting to replace the torsion springs yourself, it is important that the removal or adjustment of torsion springs is not attempted with any other tool other than Prime-Line s item number GD-52238. Failure to utilize Prime-Line s item number GD-52238 for the replacement of these springs may result in severe personal injury. These winding rods are used to wind and unwind the tension on torsion springs and they are the only tools recommended for this purpose. Two winding rods are required for torsion spring replacement. When dual spring installations are involved, it is important to correctly install both the left and right-wind springs during the same job. In the case of dual spring installations, note that proper use of LEFT-WIND and RIGHT-WIND springs is imperative. When dual spring installations are involved and only one breaks, it is important to replace both springs, as replacing only one spring may add increased strain to the older non-replaced spring. Note: To determine the handing of your torsion spring wind, look at the end of the spring with the finger of the spring at the top of the wind. When the end of the spring is at 12:00 o'clock and it is pointing to the left, the spring is a right wind; if the end of the spring points to right (positioned at 12:00 o'clock) it is a left wind. When standing inside the garage looking outside, the torsion spring with the black painted winding cone installs on the right side of the door, and the torsion spring with the red painted winding cone installs on the left side of the door. REPLACE BROKEN SPRINGS - Use this steel left hand wound torsion spring to replace broken garage door springs. It includes stationary and winding cones. REQUIRES - The use of two winding rods for replacement. When dual spring installations are involved, it is important to correctly install both the left and right wind springs during the same job. SELECTION - Torsion springs provide lifting force for heavy garage doors and must be selected by the spring's dimensions, rather than the door's weight. Use the Prime-Line's Torsion Spring Selection Guide to ensure the proper replacement part has been selected. 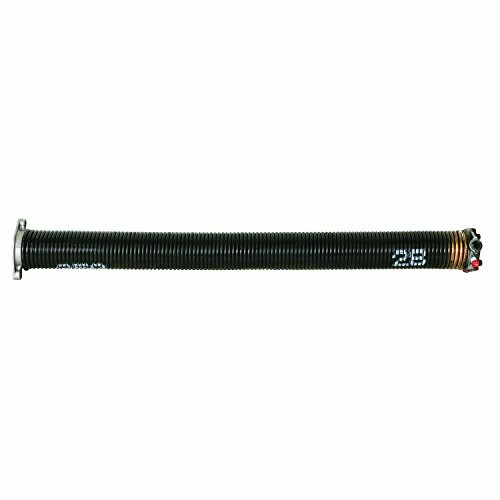 DIMENSIONS - Garage door torsion spring is: .243 wire size x 1-3/4 inside dimension x 32 length with red color code. MOUNTING - Right hand springs are mounted to left side of center and left-hand springs are mounted to the right side of center (inside the garage looking out). Genuine Original Equipment Manufacturer (OEM) parts! 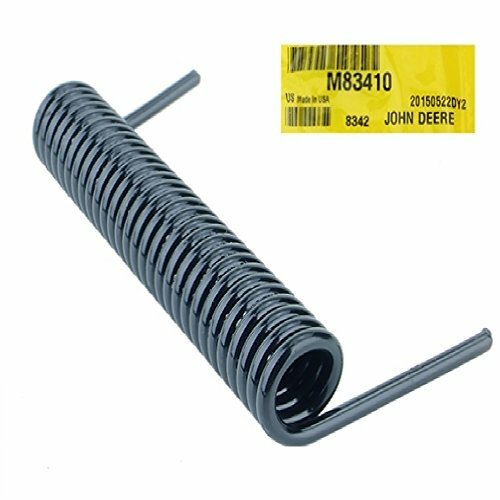 This torsion spring (part number 197026) is for lawn tractors. Wear work gloves to protect your hands when installing this part. For Craftsman, Poulan, Ariens, Weed Eater, Southern States, & Murray. 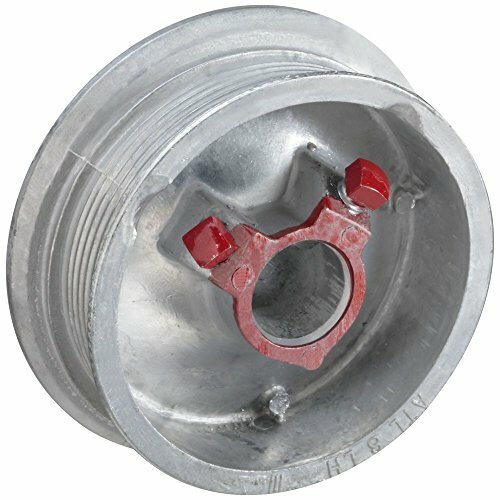 NATIONAL HARDWARE torsion cable drum, series: V7622, left hand, suitable for use with: maximum 1/8 in cable, 265 lb. Capacity, aluminum. Left hand torsion cable drums. Finish - aluminum. For maximum 1/8 in. Cable. This helical torsion spring is right hand wound and made of stainless steel 302 for greater corrosion resistance than steel music wire. It has straight torsion ends (legs) for a wide variety of uses, and the free (unloaded) deflection angle between the ends is 90 degrees. The spring has a maximum operating temperature of 500 degrees Fahrenheit (260 degrees Celsius). This stainless steel torsion spring meets ASTM International standard ASTM A313 and Aerospace Material Specifications standard AMS 5688 for quality assurance, and is used in various applications, including hinges, levers, and switches. 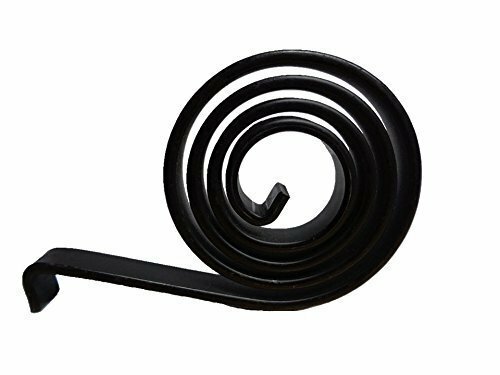 Torsion springs are open-coil spiral (helical) springs that provide resistance to twisting or torque. The spring wire can be left hand wound or right hand wound to resist counterclockwise or clockwise rotations. Various end types (such as straight or hooked) and unloaded (free) angles between the ends are available to suit different uses. Torsion springs are used in a variety of applications, including hinges, counterbalances, levers, and garage doors, among others. Look carefully at the picture as some wringers use a similar but smaller spring. To view the smaller spring search for B009EC4N26. 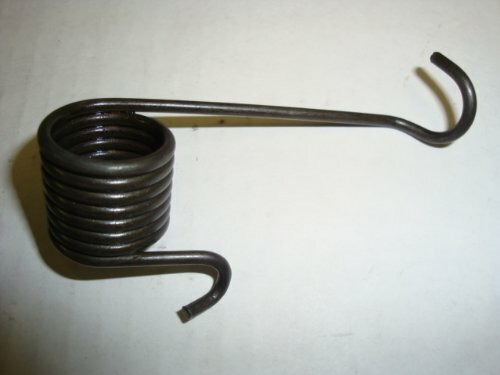 This helical torsion spring is left hand wound and made of steel music wire for greater strength than stainless steel. It has straight torsion ends (legs) for a wide variety of uses, and the free (unloaded) deflection angle between the ends is 210 degrees. The spring has a maximum operating temperature of 250 degrees Fahrenheit (121 degrees Celsius). 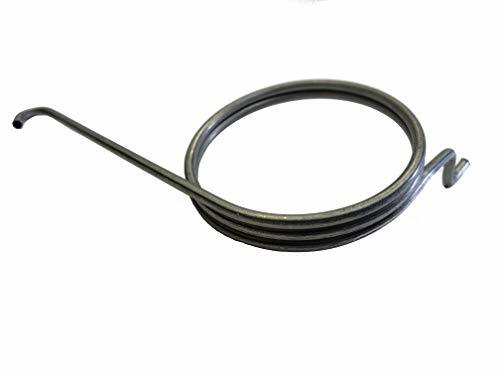 This music wire torsion spring meets ASTM International standard ASTM A228 and Aerospace Material Specifications standard AMS 5112 for quality assurance, and is used in various applications, including hinges, levers, and switches.